The twisted trail ponytail is the perfect compromise between an up and down do for your big day. 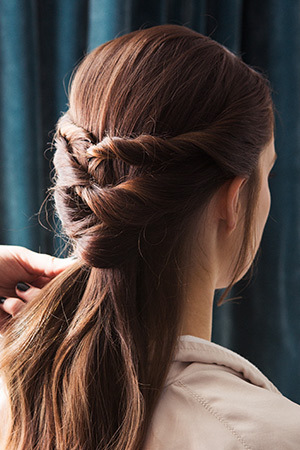 Creating loose twists with your natural waves, this boho-chic style looks great on any bride. That’s why we’re here to show you how to master this simple hairstyle in a few easy to do steps and add some floral finishes for the ultimate free-spirited style. Start by spritzing the hair with a heat protection spray before creating waves in the hair using the Keratin Protect Straightener. Next, back comb the hair at the crown of the head to add texture. Then take two sections of hair from the front of the head and create two twists, before securing them in place at the back of the head. Continue to take sections of hair, twisting and securing them in place down the middle of the head. Loosen pieces of hair as you go along for a more natural, bohemian look. 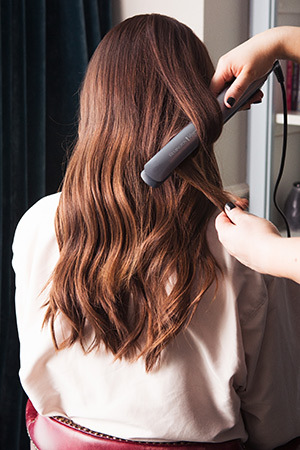 Use your fingers to pick out pieces of hair at the front of the head to create a softer look. 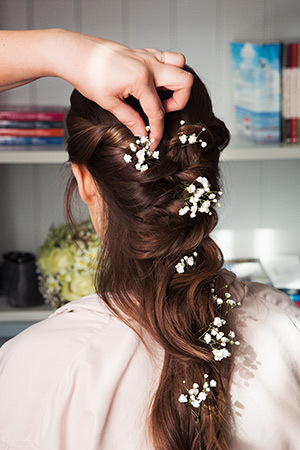 Then finish by adding a layer of hairspray and some gypsophila for decoration.